Emirates Global Aluminium (EGA) said it has officially broken ground on the new Dh1-billion ($272 million) state-of-the-art power block at its Jebel Ali smelter in Dubai in co-ordination with Abu Dhabi group Mubadala Investment Company and Dubal Holding, the investment arm of the Dubai government for power, commodities, mining and industry. The new, highly-efficient power facility is expected to reduce greenhouse gas emissions from EGA’s power generation at Jebel Ali by some 10 per cent, said a statement from EGA. Emissions reductions per tonne of aluminium produced at Jebel Ali, which includes both power generation and aluminium smelting, are expected to be up to seven per cent, it added. Mubadala and Dubal Holding have set up a new joint venture to develop this new facility, said the statement from EGA, which intends to buy the facility’s output for 25 years following its commissioning. Once the new power block is commissioned, five older, smaller and less efficient turbines at EGA Jebel Ali will be put on standby for use only in emergencies, it stated. The project is expected to reduce EGA’s NOx emissions at Jebel Ali by 58 per cent. NOx, which is also emitted by motor vehicles, is amongst a group of emissions targeted for reductions under ‘UAE Vision 2021’ to improve local air quality. 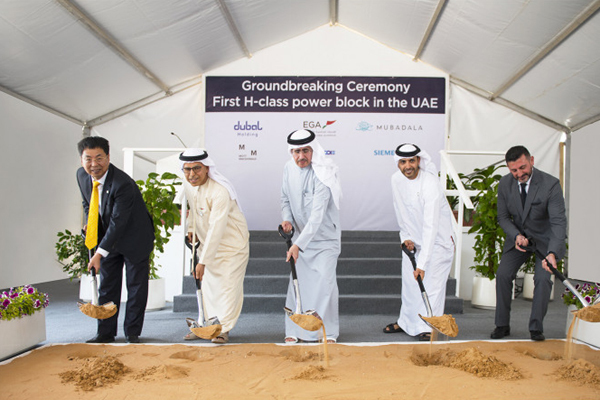 "The new project reinforces our sustainable development journey, as well as our support of one of the UAE’s most vital industries, in line with the vision and directives of UAE leadership to promote the country's leading position globally," remarked Saeed Mohammed Al Tayer, Vice Chairman of Dubal Holding and EGA, at the ground-breaking ceremony held in the presence of Khaled Al Qubaisi, EGA Board member and CEO of Aerospace, Renewables and ICT at Mubadala. "This is done through ambitious initiatives and sustainable development projects that are highly efficient in power generation and water desalination that support the objectives of the UAE Centennial 2071, which outlines the path for a brighter future for generations to come by making the UAE the best country in the world," noted Al Tayer. "Now we have broken ground, we look forward to developing this project successfully," he added. As per the deal, Siemens will be installing the UAE’s first combined cycle H-class gas turbine at the power block. The project is also the first in the global aluminium industry to use a Siemen’s H-class gas turbine, a leading technology in efficient power generation. EGA Managing Director and CEO Abdulla Kalban said: "We are pleased to break ground on this important project which will improve our power generation efficiency at Jebel Ali, saving costs and environmental emissions." The largest industrial company in the UAE outside oil and gas, EGA is jointly owned by Mubadala Investment Company and Dubal Holding. "We are now focused on safe construction and ultimately starting up the new power block in line with our plans," stated Kalban. EGA requires electricity for aluminium smelting and other industrial operations, and has captive power plants at both Jebel Ali and Al Taweelah. Its current power generation capacity is 5,450 MW.